After sold out performances at the venue in 2018 Vamos Theatre, the UK’s leading full mask theatre company return to Theatre Severn with its production of A Brave Face. A compassionate, wordless drama about the effects of PTS, showing from Tuesday 26 – Wednesday 27 February. For over two years, Vamos Theatre has collaborated with Veterans, serving personnel, military families and health professionals in the making of A Brave Face, a full mask theatre production that will tour the UK and Europe in 2019. 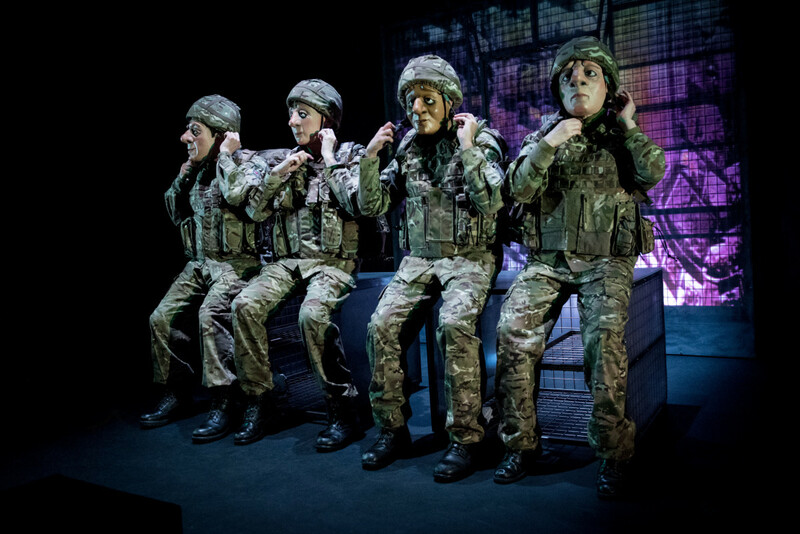 The result is an honest and hugely compelling piece of theatre inspired by the hidden stories and personal journeys of those affected by, and connected with, Post Traumatic Stress in the military. Working in a co-production with The Mercury Theatre, Colchester, Vamos Theatre aims to create a better understanding of PTS and, crucially, encourage coordinated support for those who live with it. The company has based the production on the real-life experiences of those affected, a technique for which they have gained a strong reputation over their ten year history, previously tackling issues such as dementia and forced adoption. Artistic Director Rachael Savage has been at the forefront of the research, which has seen her meeting not only Veterans, but their families, serving personnel, and organisations and professionals who support those living with PTS. Full mask theatre is wordless, which may seem a tricky medium for addressing intensely emotional subjects like PTS- but A Brave Face, whilst sometimes being raw, is also often funny and always compassionate. Whilst the show’s objective is to highlight how some people living with PTS are feeling failed by the system, it does so in a way that good theatre can – by showing the human story behind the labels and statistics, and the importance of creating hope. Tickets for A Brave Face at Theatre Severn are on sale now and can be booked online at theatresevern.co.uk, by telephone (01743 281281) and from the venue Box Office.